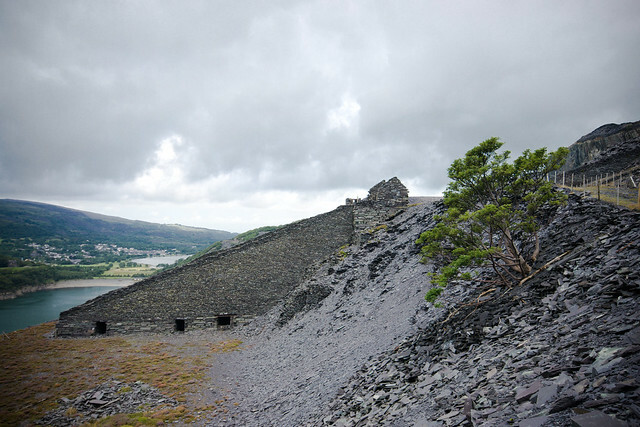 Dinorwic (or Dinorwig) was, around the turn of the century (the 19th, not this one), the second-largest slate quarry in the world, second only to Penrhyn over the hill. 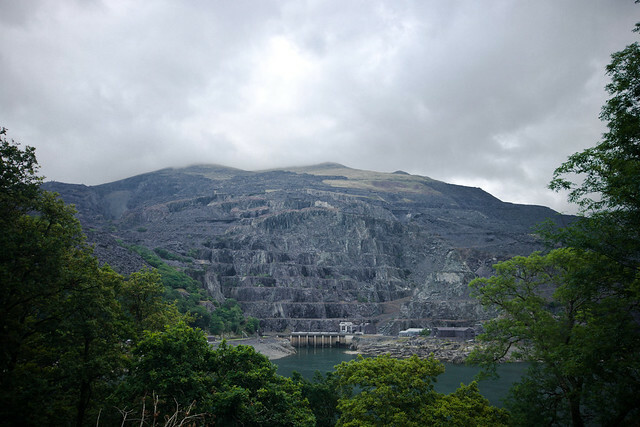 Slate quarrying started on the side of a hill called Elidir in about 1780, and at it’s peak the quarry employed over 3000 men, before finally closing in 1969. 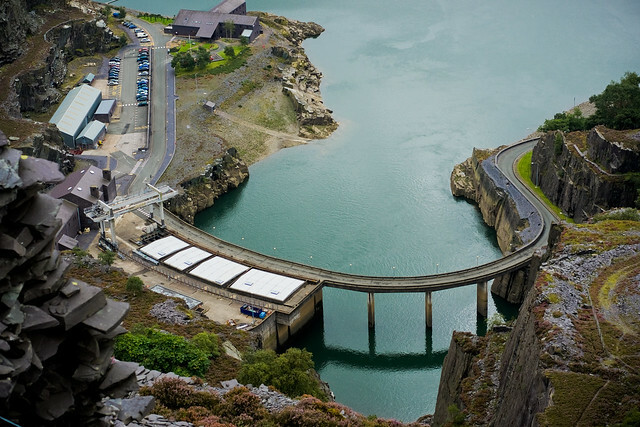 The former quarry workshops have now been converted into the National Slate Museum, and there is a public path through the centre of the quarry, but the quarry now belongs to First Hydro, who operate the hydroelectric power station that was constructed under the mountain. 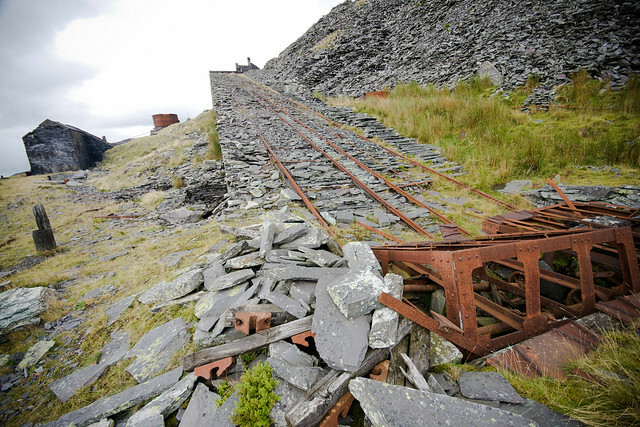 Inclines, in quarry-speak, are these angled ramps used to winch slate down to lower levels – Dinorwic has about 12 inclines, some of them absolutely massive. The winching is done from a drumhouse, powered by gravity – the weight of loaded wagons going down winches up empty wagons. From the official path, you can look down on the power station – even this high up, you can hear the turbines rumbling underground. Venturing off the official path, there are loads of steps and staircases snaking upwards. 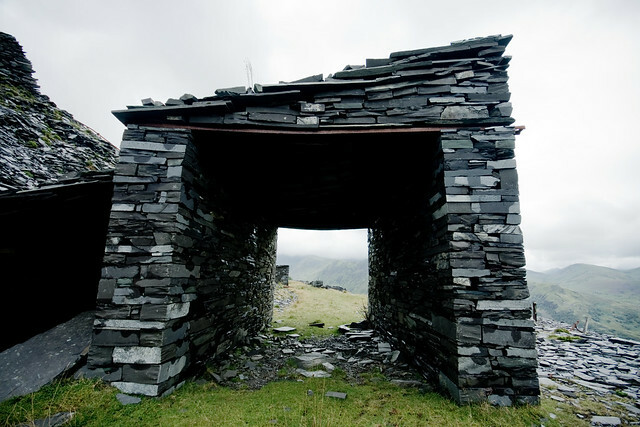 The caban was where quarrymen had lunch, and sheltered from the very worst weather – coats and boots still remain, slowly being eaten by goats. 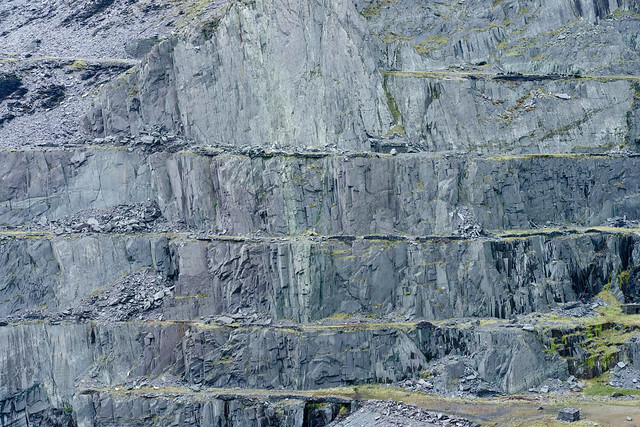 You can get some idea of the scale of Dinorwic from this – the tiny white dots on the diagonal slope in the top left are sheep. 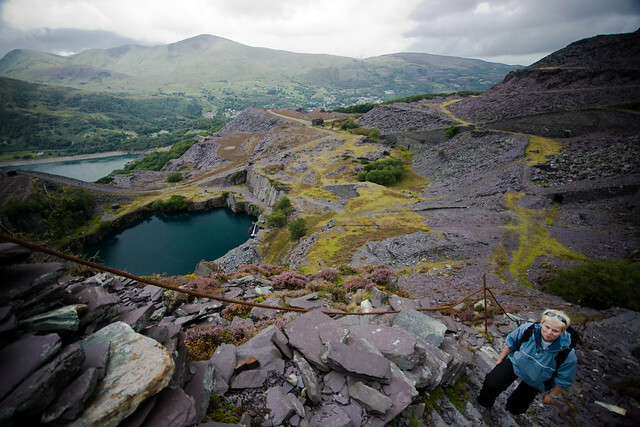 This picture shows 5 levels – Dinorwic has about 22 levels in total. Higher up, a Blondin remains attached to it’s cable. A Blondin was a type of aerial crane, named after the first man to tightrope across the Niagra Falls. 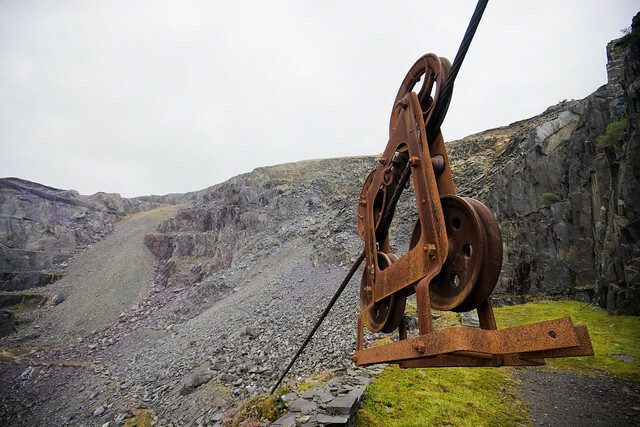 In some quarries, the Blondin could be lowered at any point, but the Dinorwic Blondins had stops fixed on the rope – men had to crawl along the rope, above the huge drop, to fix the stops in place. 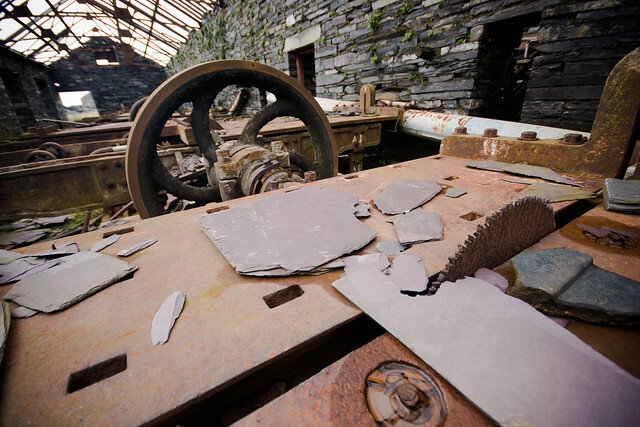 Slate quarrying is incredibly wasteful – only about 10% of slate is useful – so the huge amounts of waste were moved by narrow-gauge steam engine to be tipped. 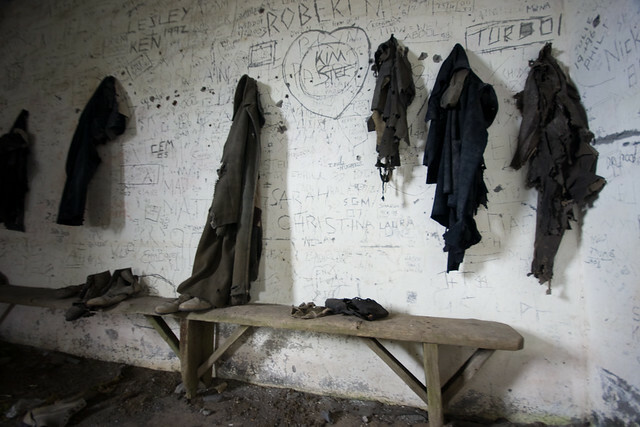 Most levels had engine sheds where the engines could be kept and repaired. 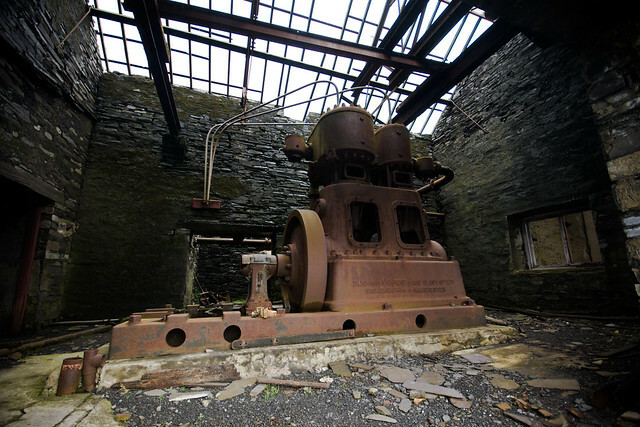 Originally, the holes for blasting powder were drilled by hand – later, compressed air was used to power drills, which meant massive compressors had to be installed high up the mountain – this one, from the 1920s was electrically-powered. Electricity also later powered the mills, where giant saw tables sliced the slate – a job previously done by hand. This is where it gets a bit geeky. 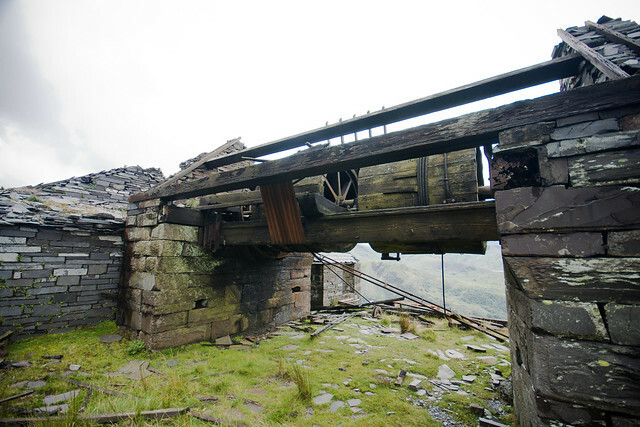 Some inclines were quite a shallow angle, and the slate wagons were just winched directly up and down. Others, like this one, were steeper, so the wagons were loaded onto special inclined trolleys. Finally, we walked back down the path that the quarrymen walked every day to work – this path isn’t on the hillside, it’s on an absolutely massive heap of waste slate. 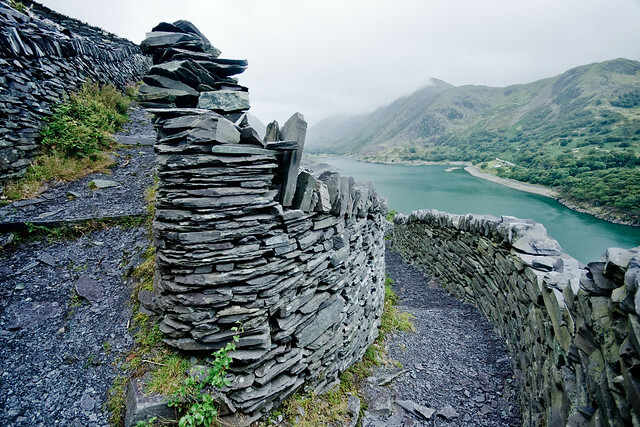 Would love to go back..Not been since 1970 s love the history….